Starting July 6, 2014, drivers may park for free for most meters on Sunday. However, some meters may still require payment including meters near the Fisherman's Wharf area and the areas managed by the Port Authority of San Francisco. This reverses the policy set on January 1, 2013 that required drivers to pay at all meters. In most cases, meters require payments between 12 noon and 6pm. San Francisco has two types of meters. The first type of meter has rates that change from month to month. Depending on how often people park at the meter, the rate will increase or decrease. If the meter is often empty, then the rate will decrease. Conversely, if the meter is always occupied, then the rate will increase. Prices on Sundays can be as expensive as $6.00 and inexpensive as $0.25 per hour. The second type of meter has rates that remain fixed at $2 per hour. You can see the different types of meters below. 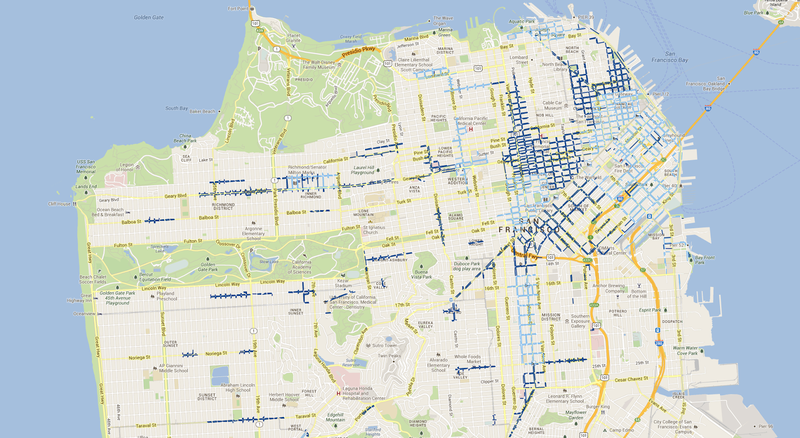 The light blue lines show the areas where the meter rates vary from month to month. The dark blue lines show areas where the meter rates remain fixed.